West Virginia Democratic Sen. Joe Manchin’s campaign said his official social media accounts had been hacked in a press release that was sent to reporters before he was set to debate his Republican opponent Attorney General Patrick Morrisey. “The accounts have since been secured. Manchin and staff are working with state and federal law enforcement officials to prevent further hacking and secure all accounts,” reads the emailed press release. The nature of the hacks was unclear, as was who was behind them. 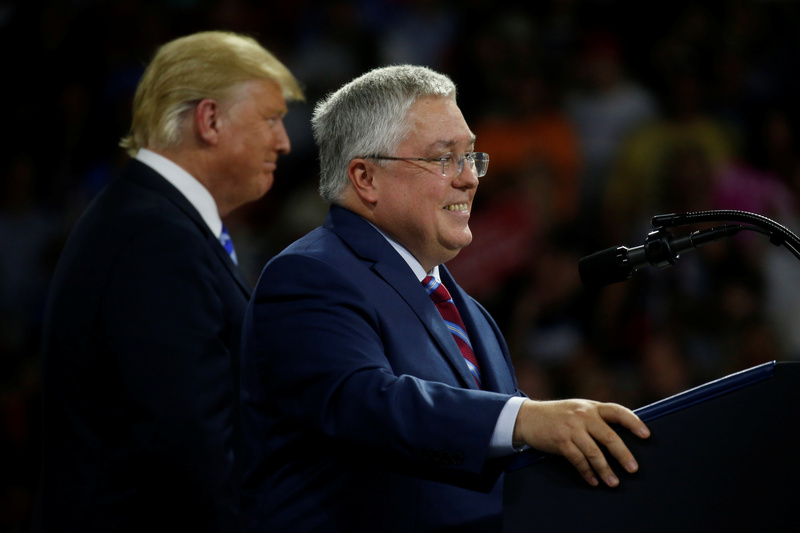 Patrick Morrisey, Attorney General of West Virginia, running for U.S. Senate, speaks as U.S. President Donald Trump (L) looks on at a Make America Great Again rally at the Civic Center in Charleston, West Virginia, U.S., August 21, 2018. REUTERS/Leah Millis. Manchin’s statement came about 45 minutes before his debate against Morrisey. Manchin still leads in the polls against Morrisey, but that lead is shrinking, according to a new poll. A MetroNews Dominion Post released Thursday put Manchin 5 percentage points ahead of Morrisey. Voters favored Manchin over Morrisey 45 percent to 40 percent, according to the poll. Manchin’s office did not respond to The Daily Caller News Foundation’s request for comment in time for publication.